This the 2nd part of a two part series on Amazon Flips in which I’ll walk you through some real life AZ flip examples. The first part I did as a guest post on the Tagging Miles blog. That part introduced you to AZ flips and in this part I’m going to go into details analyzing some AZ Flips I’ve done. If you haven’t checked out Part 1 yet what are you waiting for? This will still be here when you get back. Don’t forget to browse around Trevor’s Tagging Miles blog as well. 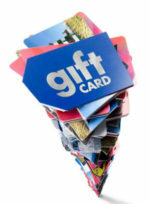 It’s a great resource for both reselling and learning the tricks for free travel. Here is the Keepa chart of one of my first Amazon flips. Looking at this chart you can see the Amazon price (orange line) has hovered around $160 price range forever (chart goes back to March of ’14) with the marketplace new price (blue line) just slightly less and then out of the blue it dropped to $65 on June 26th. 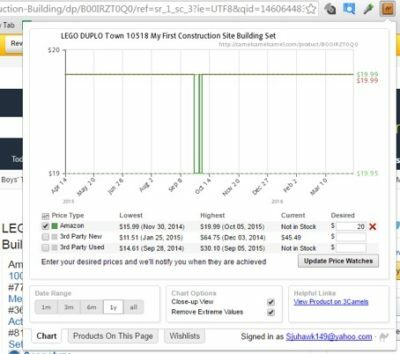 The marketplace new price is the lowest non Amazon price and includes both FBA and Merchant Fulfilled sellers. It does NOT include shipping so its possible the item has a higher true sale value then indicated by the marketplace new price. Sales rank history isn’t available for this item, but looking at reviews and current sales rank I felt confident buying the limit of 4. I then sold them all within two weeks of hitting the AZ warehouse at $143 each for a nice $62.15 profit each (just under 100% ROI). In the below chart, you can see the lowest price on April 6th is $37.95. However, you can also see the price was hovering closer to $50 for much of March. For a buy cost of $12.98 these are a really sweet prices for the low Marketplace price to be set at. One of the challenges with an item like this is the chart does NOT have sales rank so while the rank is great at $12.98, you don’t know what the rank will be at the $37+ range. Based on the price consistently being set at that price and the current sales rank I was comfortable buying a couple to test the waters. Once I got an idea of the sales velocity at the $37+ range based on those sales, I was then comfortable buying every unit Amazon would let me when they come into stock. The first two products I’ve redacted the product name, but in this final example I’ll include the product name with the analysis. Here is a picture of Amazon page of the item. As you can see now its ranked 15k in toys and games. 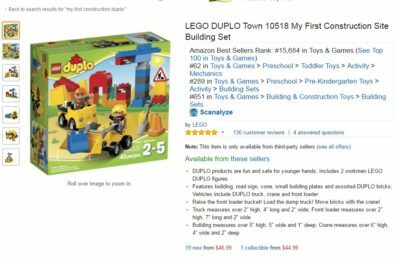 This Lego set is now retired, so it’s unlikely that Amazon will come back in stock, though they did have a few units in March so you never know. Found this guy on Keepa when it had a price drop from $27ish to $19.99. At first glance that is a pass as not really any profit there only going from $19.99 to $27. While you can see the rank is consistently under 10k there is no real profit to be made at such a small increase. However, taking a closer look back at the ’14 Christmas season you can see the price spiked up to $64.75. Also you can see that in recent history Amazon is having trouble keeping in stock even BEFORE the holiday rush starts. Therefore, as I tend to do with these type of deals I bought the max Amazon would let me and then went to Lego’s own site and bought me some more. While the price didn’t make it all the way up to $64.75, you can see it rose to $54.99 on December 12th which is over a $20 profit and 100% ROI. The key with many of these AZ flips is being patient. Many people will sell out in the $30s and make a few bucks, but if you can time it right you can really make your ROI targets. This is really important come Q4 when prices tend to increase until late December. This guy is retired so its unlikely you’ll see much supply of it, especially at the $19.99 range, but certainly helps to keep an eye out as you never know. 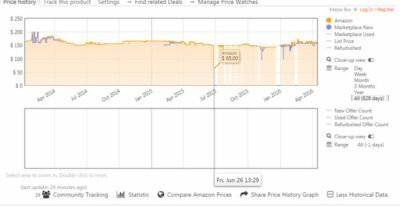 As you can see in the chart, Amazon was in stock at $19.99 on March 17th. It didn’t last long, but they dug up a few somewhere that sold real quickly. When I find a good AZ Flip what I do is I setup an alert with CamelCamelCamel (CCC) for my target buy price. I click on the little camel widget on my browser and it pops up the chart and then I set my desired price. Then when AZ comes into stock at the price I get an email. AZ Flips can be very profitable. I wouldn’t recommend Amazon as your sole sourcing place, but another source to include in your sourcing tool belt. We frequently post AZ flips on the Sourcing Simplifiers FBA Facebook group so I suggest checking it out. I’d never buy anything just because someone posted it on a Facebook group, but instead do your own analysis like I did for these items to determine if the buys are good for your business. And if something doesn’t look right or you have questions just ask. 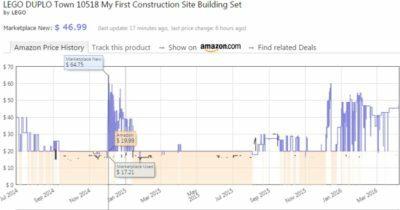 This entry was posted in Fulfillment by Amazon (FBA), Online Arbitrage. Bookmark the permalink.